I love your map! I've had this book on my wish list since it was announced... it might have to be a present to myself after Christmas. There are a few maps I'd like to try, but I think the first one would be kind of literal - I love to travel, so I want to do something that incorporates the places I've been with lessons learned there and how it impacted me. I'm afraid I don't know what I'd do a map of, but I know I would do all of the examples in the book. I love maps and this is one on my wish list. fascinating idea. What would I map, probably start with my journey into art journaling and how that developed into my abstract work. Love to win! what a great book to win! well, let me see. I think I would map my life after getting married. We were in the military and moved a lot and made lots of friends all over the place and had babies in different states so yeah, that. this book sounds like a great gift for not only myself but a few of my friends....great price for a theraputic journey!!!! I have always been intrigued by maps. They can let you know where you have been and where you are going. The maps I have made are very similar to yours and they do look like game boards, but I did not realize that until I read your post. My brother draws maps that in the shape of a wheel with the subject or goal in the middle. Would love to win this book--if I don't I will surely purchase it. Wow, your map is amazing. I'd like to do a map of an idea--from an inkling of a apart to a full concept. I would love to add this to my work table OPENED. I would map my journey on recovery from the loss of my husband just a month ago. I think it would be the best therapy I could get. I have no idea what map i would make but maybe the book could point me in the right direction.... Thanks for sharing! I think I would make a map showing how I searched for and found my biological parents and siblings. I think it would be therapeutic. I'd like to map out my next novel. I use plotting techniques, but I think this book could inspire me to think of plotting my next story in a different way using a map of some sort. It sounds like making your map was cathartic. I think I'd likely make a map similar, just about being diagnosed with MS. I've sure been through alot in the last 4 1/2 years since the accident that lead to being diagnosed. Sometimes it just doesn't seem real-I mean having chemo at 38 for something OTHER than cancer ( to try and beat down my immune system to try and get my MS into remission)wasn't even remotely in my plans. It's certainly been an interesting side trip. I love your map. I've been toying with the idea of a life map, incorporating milestones in my life.. first job, college, wedding, etc. Your map is wonderfully designed Judy. I can see the board game inspiration. I too am sometimes amazed at art and the brain. My map would consist of how to cope with rebellious teenage boy and not lose your sanity. A map I no longer need... Thank God! What a great book! I would make a map of all the places I've lived. Then I would make a map of my creative journey & how it has evolved over the yrs. Thanks! Your map does remind me of childhood board games! My own personal map would display my ever widening (?) discovery/ journey into journal making, from first reading about Teesha Moore, and from there learning about more and more (and more) inspiring artists. Having just turned 50, I think I would probably make a map similar to what Marcia suggested - life milestones such as jobs, where I've lived, etc. But there are so many possibilities with this sort of prompt, such a great idea! I want to map all the places I'd love to visit but have not yet seen just so it's out there in the universe! My map would be my travels with art that started big time around 2007 till now and how it's evolved and grown. And all the artists I have met along the way who have influenced and encouraged me. I'd love to have a chance to win the book Judy. Thanks and congrats for being a part of it! I liked seeing your map as I clearing recall the ordeal you went through with your surgery. Glad that is behind you now. I have so many ideas for maps and getting more from reading comments. I think my map would be about where I want to be in 20 years. I'd rather have a map than wander aimlessly for that amount of time. Beautiful map! Can't wait to see the book. My personal map would include the different schools my son attended. I would map my struggle with being in my studio and playing. I would may a day in the life of my kitty! I really love your map, Judy! I have said that I would map my heart, my spiritual journey, my hands -- today I think I'll map something totally crazy. I have recently become interested in dehydrating fruits and vegetables from our garden, and have been learning how to do it. I think I would map how food gets from the garden into jars and vacuum sealed bags. Sort of a "how to" map. Having just returned from a fun trip I was thinking it would be fun to map my adventure. This book would be just the ticket to get the old brain moving in the right direction! Thanks for the chance and I love your map. Very exciting. I just love this notion of mapping things through art. I've thought of quite a few map possibilities during this bloghop. Right now it seems a good idea to map our youngest daughter's journey through college from San Francisco to Paris, home to Seattle and on to NYC where she's now an architect doing the planning for Apple stores in China..woohoo. I'd love to win this book for a neverending supply of ideas. I think I would make a map that would lead to my personal healing that I have found today. It would contain all the heartaches, roadblocks and celebrations that have led me to this point in my life. Hmmm...I think the map I would most like to make would be one detailing my service in the Peace Corps. From the application process to my one-year mark in Ukraine and what all of this has meant to me. I would like to explore relationships by creating a map with islands for the individuals and then show the relationships using shipping routes from one to another. Seems kind of cool if I could figure out how to do it from the book! I'd make a map showing my journey through perimenopause/menopause. It's been long and difficult! I'd like to try to map my daydreams. How they lead from one thought-place to another. Judy, your map is marvelously inspiring! 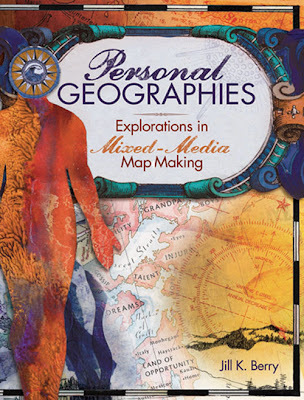 I am in love with personal cartography, life mapping, exploring new ways of telling/showing one's story. One map idea I have is to illustrate all the great friends that I've had throughout my life, my favorite memories with them, and how they helped me grow & blossom. I'd love this book. I'd map out all the selves I've been. There are so many, it would be interesting to revisit myself. Maybe I'd learn who I am. This is so much fun! I'd love to make a map of all the hockey rinks I've been in during my son's many years of playing travel hockey. I'd like to map my spices. What the plant looks like and where they come from and then where I use them in a recipe. I love maps but my daughter REALLY loves maps. This would be such a fantastic gift for her...it will probably appear on my bookshelf soon! I love this. I've done a map of my perfect day, before, but I will have to try one that covers a longer period of time. New art journal idea. Thanks, Judy! Love your map, btw. I think I'd try to map the barking of dogs in the cool stillness of a winter night. I'd love to map a walk through the woods. Love your map and love the book! It's definitely on my list. I would make a map of my journey moving from one coast to the other and the 2 years of life changes that led to this move. this new way of thinking of maps is interesting. i would combine highlights of life with my family. think i would probably make some smaller, more focused maps first and then proceed to a broader life map. i am sure the book would be a great resource for me to organize my thoughts for this project. I love maps and I think the first one I would do would be of my art journey to see just how far I have come or maybe just try to map the current disparate things I do and try to make a more cohesive whole. Either way i would love this book to help me. Your map is gorgeous! I am trying to think how I could use mapping to leave a work of art for my children...some sort of treasure map maybe to express the "important things in life" and to warn them of "dangers"...I don't know...something to think about and flesh out! I'd like to map all the arts and crafts I've done over the years and what I plan to do in the future. I would map out my craft projects. Hmmm.... tough question, I LOVE maps! So, I'd make a map of my journey as an artist (who is still playing with wax). Thanks for offering! I think I'd like to make a map of my mind ... not a mind map, but one that charts all the interests, peculiarities, and storage space. Fingers crossed I win a copy of this book! Thanks. I just had the best idea for my map. My daughter and I are driving up to Artfest from Oklahoma. We love to do road trips. I am going to make a map as we travel. I will include alot of things we see on the way and things that happen. What fun this will be. Thanks for this opportunity. What a facinating method of journaling! I am off to check out the other blogs. Thank you for sharing and congratulations on being in the book! I am loving all of these ideas. I want to map my son's journey thru the wonder of dyslexia and words and our crazy English language. I love the idea of personal maps as a starting point for creative work. I'm a quiltmaker and this concept is giving me lots of ideas! I think I'd work on a personal map of recent travels. Thanks so much for the opportunity to win a copy of the book! Time and space are a little mixed up for me, so I'd love to map the way they come together for me over a typical day. Or week. Or lifetime! Hi Judy, I love your map. I've seen the book but don't have my copy yet and would love to have one. I would map my upcoming journey into the world of no-longer-full-time-employed (aka retirement). Hmmm, a map of my epic journey across country with my dog would be a fun thing to map. That trip was a long time ago but I have lots of pics that I never collected in any cohesive way. The dog involved is still very much alive and my longtime companion through life- it would be a great tribute to him. Your map was inspiring. I'm nearing retirement and can't think of a better time to create a map - where I have been, where I might go next and the possible pathways. I think I would like to map an imaginary night sky - stars, planets, constellations and the possibility of it all. I would love to make a map of my sometimes all over the place thoughts! Hehe! I would also map places I would love to visit. i grew up in an army family and traveled all over... and have continued to travel ever since i realized that a passport opened many doors... would love to win this book.. but if i don't win one i will buy it.. but don't let that stop you from finding my name in your drawing!! I've left the full time job world and would like to map my retirement. Full time art, full time grandson, part time travel...so much to do, and finally the time to enjoy it! One of the most exciting days I have had all year...to read of this book and to be introduced to your blog. I am a recently widowed 80 year old with a BFA and 20 yrs. experience as an art teacher. Now that I am no longer needed as care-giver, my "art self" wants to be reborn. Beautiful map, Judy!! I think I passed you enroute a couple of times. What a journey! My map would trace my development as a mixed media artist. It would be fun and valuable to revisit those earlier times and see how far I've come. Love this concept. My map would have to represent an imagined journey from where I am now (emotionally, physically, and in my career), to where I want to be -- 1 year, 5 years, 10 years from now. Visualize it and it will come! 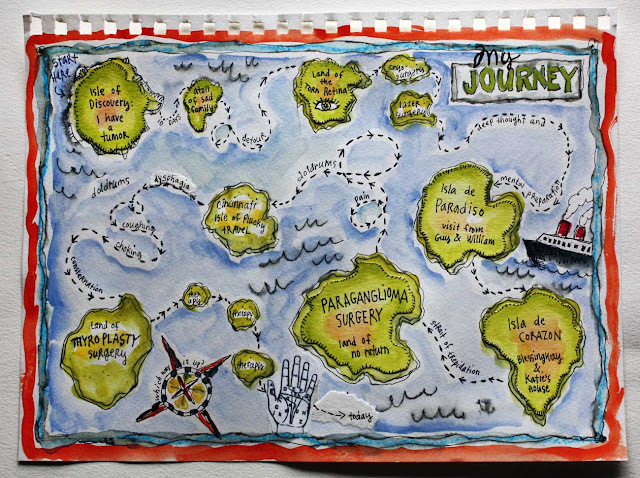 I love this idea of creating art maps. It would be fun to try to map one of my crazy dreams! My fingers are crossed. I would map my heart--soft spots, cracked and broken parts, open wide and fenced in parts, new growth, well-tended mature parts. I would make a personal map of a trip to the Virgin Islands I took with my Parents & my husband, John. We sailed on a 42 ft. Morgan for a week around the islands. We anchored in different coves for each night. We docked at several islands for adventures. Would love to win a copy, thanx so much - good luck everyone! I would make a map of the future, to help me chart my course. i love how you captured your journey in this way. brilliant. my friend aimee is in this book. seems like a must buy. I would map out my next novel. I usually use some big poster board and plot out the critical plot points. But I think exploring another form might help me get to the heart of my story in a different way that might let me into the emotional arc of my story quicker. Worth a try! Thanks for the opportunity to win the book! I would map my journey. I would do a map of my family relationships . . .how they've changed and evolved. sort of a timelineish thing! I'd take some fabric, paint it and doodle on it, and then coat it or spray it with something to protect it. I'd then cover it with black acrylic, not rubbed in. Once that was dry, I'd scratch into it to create my map, and see what I came up with! Honestly..im not sure what I would draw. Maybe the progression of my life..a map for my son for the future. Makes a person think. I wish you a Merry Christmas, Judy. Your map is great! I just love the metaphors! I keep feeling the urge to make personal geographies but it hasn't turned into anything yet. Soon. I feel it. This book is on my list! i love your map - it's so YOU! what a fabulous book! I think I would make a map of my neighborhood, and the roads and paths I follow each day. It would remind me of the Milly Molly Mandy storyboard map that my mom and I created when, I was a child, living in England. We followed her journey whilst reading a chapter each night. Love this map and all the blogs I've seen on this little adventure. I'd have to blog this trip! I just had surgeon myself, and feel inspired by your map to do something more pictorial to see how this trip went for me, and perhaps where it will take me.